Sloto Cash Casino Review - Is This One a Recommended Casino in 2018? Some of the best land-based casinos can be found in the United States but, unfortunately, the same cannot be said for online casinos. There are a few casino brands on the internet which provide a legally sound service to US punters, however, such as Slotocash Casino. That said, this relatively small casino only offers a handful of online roulette games, although it will reward newcomers with a €/$1,000 casino welcome bonus over their first two deposits. Sloto Cash Casino has a little bit of everything, from the most popular RTG slots to a fair selection of table games. They use the latest security methods to keep players’ personal information and data safe, making it a safe and trusted place for Roulette players to deposit and play with their minds (and pockets) at ease. If a quality RTG gaming experience is what you’re looking for, Sloto Cash Casino can offer you just that. First deposit: 100% deposit match up to €/$500. Second deposit: 50% deposit match up to €/$500. There are a few caveats, however, and punters hoping to use this bonus for roulette games will not be happy. That is because any wagering on roulette games will not count towards the wagering requirements of the bonus. Those play through conditions ask players to wager the 100% bonus at least 25x and the 50% bonus at least 22x before a withdrawal is made. Of course, you could use this online casino bonus to play at some of the slot machines listed in the lobby, but you should know that the bonus is not offered to players from the following countries: United Kingdom, Greece, Portugal, Russia, Sweden, Romania, Poland, Hungary, Bulgaria and Mauritius. Punters might be slightly underwhelmed with what this casino has to offer, with just two online roulette games listed in the lobby. Those games are as simple as they come, presenting European Roulette and American Roulette with no particularly special extra gameplay features to add a bit of excitement to the proceedings. At least punters will have the choice between playing with just a single zero in European Roulette or the two zero pockets that are available in American Roulette. Of course, part of the beauty of roulette is that the game has barely changed over the years, but nothing quite beats the thrill of an extra bonus spin or a chance to win a progressive jackpot. If players do want to get their hands on a progressive jackpot, then they can check out a range of games which offer ever-growing prize pots. The jackpot section of the casino website features a handful of table games such as Let ’em Ride, Caribbean Hold ’em and Caribbean Stud Poker. If you’d rather escape the virtual casino atmosphere for some more adventurous gambling action, then you can play on some progressive jackpot slots from Real Time Gaming, such as Spirit of the Inca and Megasaur – the latter of which offers a feature guarantee gameplay element. While you might not find many interesting spins on the roulette wheels at this casino, players will find plenty of exciting spins to be had with a range of online video slots from Real Time Gaming. The slots come in all shapes, sizes and themes, from retro 3-reel classic slots like Sevens & Stripes to novelty 3-reel games like Jumping Beans. The 5-reel video slot lobby is full of silly spinning action with games like Builder Beaver, Naughty or Nice, and Rudolph’s Revenge while there are some more serious historical slots like Aztec’s Treasure, Caesar’s Empire and Ronin. If 5 reels aren’t enough, then you can always step up the intensity with Super 6, Lucky 6 and The Big Bopper, all of which feature 6 spinning reels instead of the customary 5. Sloto Cash Casino has a modest selection of games. There are five versions of Roulette, them being, French, American, European and Multiplayer Roulette. There are also a couple of other table games available to play like Blackjack, Craps and Baccarat. As the name suggests, the casino has an abundance of slot machines, and slots tournaments are held daily. One can also find a choice of Keno, Bingo, and Scratch Cards. On the downside, there isn’t much Poker on offer, there are no Live Dealer Games, and there isn’t a sportsbook either. 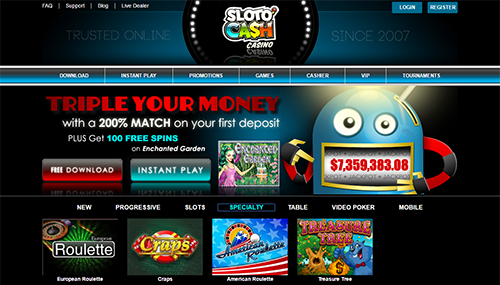 Sloto Cash is powered by one of the pioneers of online casino, Realtime Gaming (RTG). The casino has a range of the provider’s most popular slots and progressives. RTG are a company willing to license its games to operators who accept American players. 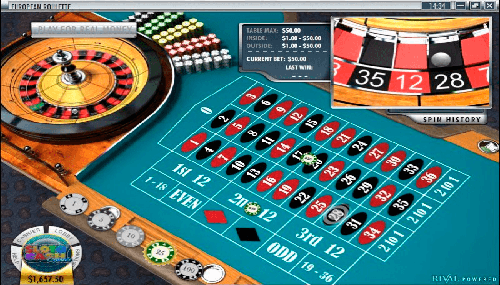 The full casino is available to play via download; however, there are some games which can be played in Instant Play mode. There isn’t an absolutely huge list of payment methods at Slotocash Casino, but punters should be able to find a relatively popular and hassle-free way to deposit or withdraw at this US friendly online casino. The payment methods are as follows: Visa, Mastercard, Skrill, Neteller, EcoCard, Bank Transfer and Bitcoin. The smallest deposit possible at the casino for all methods is €/$25 and that amount applies as the minimum withdrawal limit for e-wallets such as Skrill and Neteller. Cashing out with cheque or bank wire transfer have higher minimum withdrawal limits of €/$100 and €/$150 respectively and they may also incur a hefty charge from the casino. The maximum withdrawal limit per week is €/$5,000 and all withdrawals must go through a 72 hour pending period. Sloto Cash Casino does not welcome many currencies to make deposits with when placing your bets. The casino accepts the American Dollar and Bitcoin, which is similar to having digital cash in an e-wallet. Payments can be made in a number of ways, including Visa, Mastercard and American Express credit cards, popular e-wallets such as Skrill and Neteller, prepaid cards from ECO Card, bank transfer from Bank Wire and Direct Money. Note that you may be charged an additional fee of between €/$0.01 and €/$1 per transaction by the credit card processing banks. Sloto Cash Casino is keeping up with the trend and therefore has its own mobile platform. Players are free to launch the mobile casino lobby by visiting the casino’s website from their preferred mobile or tablet devices. The casino continually adds new game titles and features and gives its members the chance to receive special text offers and deals not available to those playing on desktop. Roulette players can install Sloto Cash Promo Alerts from their mobile device. They will then receive four promotional text messages per month with national deals. The mobile casino is compatible with most Android and iOS systems. It does not support Kindle tablets, Blackberry and Samsung Galaxy S2. Sloto Cash Casino has a decent selection of progressive jackpot games. These include the Caribbean card games; Caribbean Stud Poker, Caribbean Draw, and Caribbean Hold’em. Another card game with a progressive jackpot is Let ‘Em Ride. There are also a couple of slots with this feature; Aztec Millions, Spirit of the Inca, Shopping Spree II, Jackpot Pinãtas, and Football Frenzy all have massive jackpots ready for the taking. These are just a few game titles from the selection on offer. Slotocash isn’t exactly the most impressive casino if you are looking to play roulette online. Then again, the casino is open to US players, and US punters can’t exactly afford to be too picky when it comes to playing gambling games on the internet. Even so, the casino does have a less than perfect reputation for customer satisfaction, with an alarming number of complaints about withdrawal problems. Plus, the casino welcome bonus, albeit a very handsome €/$1,000, does not allow players to wager with roulette.